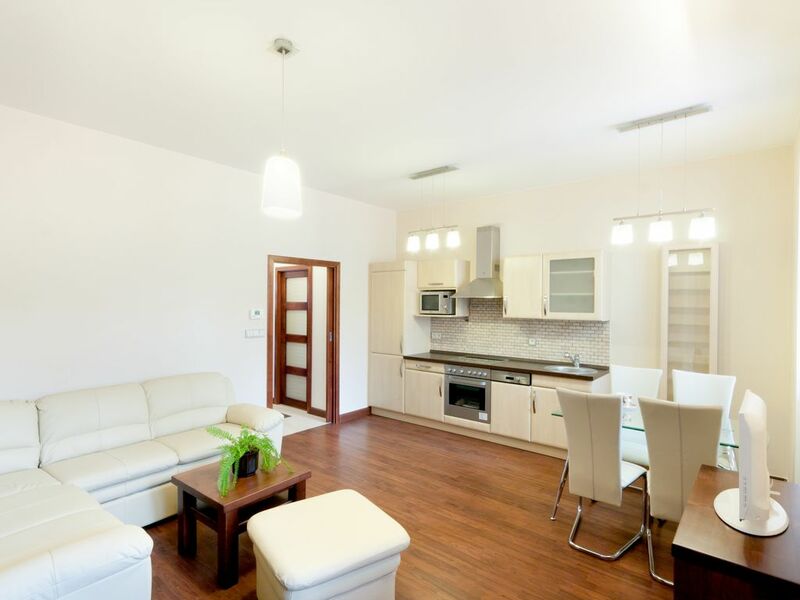 Let me offer you our Charming Luxury Apartment with the centre of Prague right around the corner. The apartment was reconstructed to meet the high standard of our guests staying in. It has a bedroom with double bed and spacious wardrobe for your clothes and a living room with pull out sofa bed where another person can comfortably sleep. Kitchen is fully equipped and has all utensils/appliances you might need for your own cooking. Fridge, diswasher, washing machine etc. are commonplace to ensure your stay is like at your own home. During warm summer the air conditioning in the bedroom and a fan in the living room is a nice touch. In case there are more of you in the party, we have another 3 apartments in the same building which sleeps 4 in each ( vrbo 612688). First time in Prague and would like to avoid all the hassle at the airport? To make your arrival smooth and nice we would like to offer a private transport from the airport/train station for the cost of 650CZK/400CZK per car per way to take you to the apartment, where I will personaly meet you to show you the place and everything around and to answer all possible questions concerning your stay you might have. Our driver who will meet you in the exit lounge of the airport is very nice and speaks excellent english. Extremely quiet, comfortable and equipped with everything you need to feel like at home. Hair dryer and towels provided. Air Conditioning in the bedroom and fan in the living room. With plenty of English channels. in English. We also provide leaflets, guide book about Prague, maps. Monika and Petr were patient and responsive host! Thanks for picking us up so late at the train station and dropping us so early at the Airport Petr! The Apt is really close to Andel Station Metro's, Trams, Supermarket, Mall and even a Starbucks. Just a few FYI's The apt is literally next to and above some businesses and it can be a little loud - especially when the gate is closed and the drivers lay on the horns to get everyone's attention. The building has seen better days but the apt itself is just as you see it in the pics! Its a great apt .. Another FYI The bed was clean just not what were used too ..there are 2 large square pillows, 2 single comforters with duvet covers, bottom sheets but no top sheet -only a bottom sheets. We learned this is typical for the area. just not comfortable for us, Also we had to ask for new towels since the ones we were given had were really scratch air-dried. Lovely, modern apartment. Very versatile location. If you're going to Prague, stay here. We had five days in Prague and our apartment stay made it a very comfortable five days. The apartment itself has everything you need, and most of it fairly new. The location by Andel station is pretty much ideal. There's easy access throughout the city via the tram and metro, and there are a number of restaurants and pubs for dining. If you want to eat in there's a couple of grocery stores as well as a brewery. Our host, Monika was very helpful. She arranged transport for us to and from the train station, as well as providing information on the city, what to do, and how to get there. She was excellent in responding to emails/enquiries. Staying here was a pleasure, and one I hope to experience again. Monica muy atententa brindandonos un excelente servicio en todo momento, adicionalmente nos envió un chofer a buscarnos al aeropuerto, esto hace que la llegada sea mas confortable. El departamento es excelente, muy amplio, luminoso con muy buenos muebles, y lo entregaron muy limpio. Las camas muy cómodas y todos los elementos de confort , muy bien equipado. Monica nos ayudó mucho a como movernos en la ciudad y cuenta con mucha informacion turistica en el departamento. Nos dejó tambien lo basico para poder cocinar. La entrada al departamento no es muy linda.. una puerta gris... ingresas como a un parking.. con tachos de basura.. una escalera sin pintar.. un poco raro el acceso al departamento.. pero cuando ingresas al departamento.. todo eso desaparece.. y por dentro es muy lindo... luego te acostumbras.. Esta muy bien ubicado a una cuadra de la estacion del Metro y a dos del shoping que esta muy bueno, ademas de los cafecitos y restaurants.. que producen un muy buen ambiente durante el día. Un solo temita, le pediria a Monica si puede renovar las toallas que estan un poco viejas. es muy recomendable este departamento. The apartment is very beautiful and contains all you need for perfect holidays. Monika is a very friendly person who explained everything very well. She organisated our trip excellent and was always perfectly prepared. On the one hand the location is interesting because Smichow is exceptional place with many many nice restaurants and night life. In addition you can acces public transportation easily which take you to the old town Prague. On the other hand the apartment is not quiet enough; even at night it was difficult to sleep because of different noise. Downstairs there is company which starts to work at three c'lock in the morning. Maybye for many people this means no problems but for us it was bad. Dear Maren, thank you very much for your complimentary review which we very much appreciate and would be pleased to have you in the apartment anytime again in the future. I was just a little bit surprised by your comment about the noise which disturbed your sleep. When I met you for your check-out you didnt mention anything like that and was only happy about your stay. I am now very sorry to hear that something was not according to your wishes. I would like to ensure all my future guests that the apartment is even located in a little courtyard with windows not leading on the street and therefore no noise from the street can be heard in the apartment. It is right that there is a company starting their business in the morning but they are very quiet and considerate (they have to be otherwise local people living in the same builiding would call a police) and other my guests even dont hear any little noise and are not awaken and disturbed at all. Perfect location to access public transportation! Stayed in Monika's property for 12 days while we enjoyed the beautiful city of Prague. Excellent location for accessing public transportation to all of the sites. The apartment was clean, very comfortable and convenient. Great restaurants and a shopping mall just a block away. The apartment is situated in the beautifull Andel area with its Novy Smichov department store a few minutes walk. There are all shops you might be looking for with the great cinema to spend a romantic evening in while watching the newest movie on. There are also plenty of restaurants around the apartment to choose from. Whether you love Mexican food, or prefer Italian pasta, or would love to taste typically Czech dishes I am sure you will find a place to stay for your dinner and you will not need to walk far. Upon check-in I will have a map and plenty of leaflets in the apartment. I will also check you in personally so will be more than happy to provide any suggestions.